It’s here! The Falcon has landed. Solo: A Star Wars Story jumps out of hyperspace and into theaters this weekend, and audiences finally get to decide for themselves if this latest non-saga film passes muster. We got an early look at Solo this week, and it doesn’t disappoint. The only major detrimental factor to this movie’s otherwise successful presentation is an annoying bit of overly expository opening text, but don’t get excited: it does not feature a space-borne intro crawl. Instead, the trademark “long time ago…” is followed by yet more blue text, over-explaining Corellia, Han and the economy of scavenging for food (which we’re well aware of, thanks to Rey in The Force Awakens). While reserving the scroll-text for saga films among the Star Wars collective is a reasonable choice, subbing in anything for it, especially when it is not necessary, is just inconsistent and sloppy. Beyond that, however, is a story that fits the overall narrative of the Star Wars Universe very well — complete with nicely executed visuals, Easter eggs aplenty, familiar musical flourishes, cool tech and a well-balanced drama/humor flavor. The film includes one the best “train heist” scenes ever screened, as well as a huge cameo that’ll be the buzz fan conversations for the coming weeks. The enriching expansion of the canon is served well by the settings and details of Solo, and the pace of the flick is reinforced well by a strong script to match the actors’ successful portrayals. One big point of contention among the cynical droves of neckbeards pre-hating on Solo has been the design of the Millennium Falcon. While this is a very petty hangup, fans can be sure all their concerns about color, shape, condition and even that pesky filled-in mandible nose will be settled by the time the credits roll. 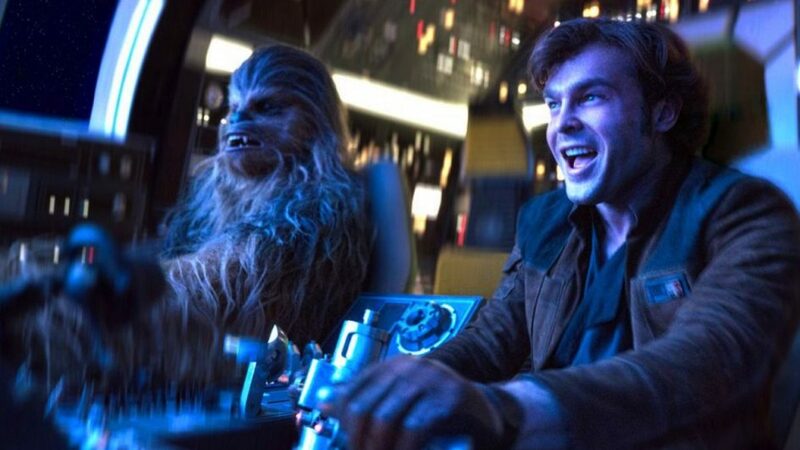 Despite changing directors and a variety of reshoots, Solo is a success, and the balance between those changes and material already in place flows very well. While audiences will be able to pick out elements like Howard’s street-speeder tribute to American Graffiti and a cute “can’t go if you’re looking” gag most likely attributed to Lord and Miller, the final product has flow and foundation. Solo is rated PG-13, runs 135 minutes and clocks in a solid four out of five here in the ZIMB ratings.